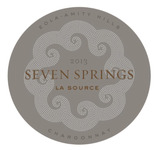 The wines of 2013 at Seven Springs exhibit a classical, elegant restraint that we love. Vibrant acidity and some richness provide a counterpoint to the purity of fruit. The minerality is immediately apparent, as is a beautiful tension that provides a stunning elegance. The most complex of our Chardonnays, Summum is one for the cellar. Taut, focused and juicy, with lemon, lemon verbena and mineral overtones to the lithe, lively, open-textured pear and apple flavors, which linger expressively as the finish floats on. Drink now through 2023. 288 cases made.